The 40th round of the Cairo Film Festival set off on the evening of 20 November with a star-studded guest list. 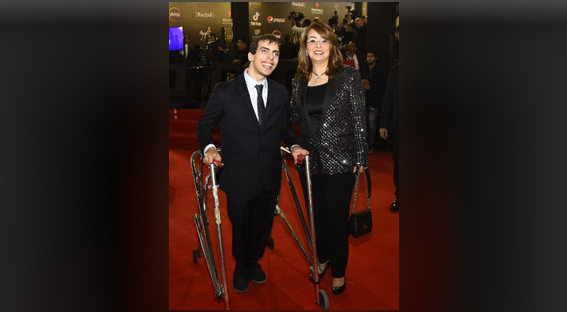 Among the highlights of the opening session was the sight of Minister of Social Solidarity, the beautiful Ghada Wali, proudly walking the red carpet hand in hand with the young pianist Michael Magdy who has a physical disability. Dr Wali made the point that persons with disabilities should be integrated within the community, and welcomed at all events. She said our society needed to change the common outlook that tends to isolate persons with disabilities; on the contrary, they mingle with everybody and people should get used to their presence. Dr Wali was at the festival because the Ministry of Social Solidarity was participating in the festival competition with documentaries on its activities and initiatives, with real life characters playing lead roles. Wali pointed out that the films produced by the Ministry partake in local and international film festivals, divulging that the film “Forsa Tania” (Second Chance) produced by the Ministry of Social Solidarity has won an award in the New Delhi Film Festival. The film documents the experience of rehabilitating the children at the penitentiary institution of al-Marg, and the positive change this had on their lives.